‘I feel embarrassed for York, which is not a feeling I care for at all. It’s been wonderful to read your good sense on all this … once I talk to people about this (those who aren’t bored rigid by it all) I find that so many of the people I know, not only friends/neighbours but people in the tourism, heritage and history business as well, feel the same way. In the campaigning to have Richard III’s remains reinterred in York the city’s elected representatives have some enthusiastic support from all corners of the world. But perhaps not as much as they’re suggesting from the people who actually live here and who voted for them. We may have been hoping that it would all die down, but last week the ‘York v Leicester’ Richard III wrangle went to Westminster. 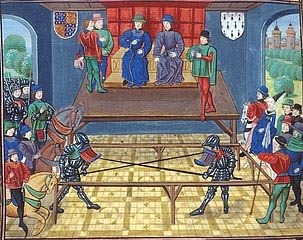 Last Tuesday York Central MP Hugh Bayley, and Jonathan Ashworth, MP for Leicester South, unfurled banners and rode into the hall on horses, and had a jousting contest in front of cheering crowds, to settle the York v Leicester thing. No, not really. It was merely a debate. Harking back to past conflicts, Mr Bayley wore an enormous white rose in his buttonhole. I wondered if it might be one of those joke flowers clowns wear, which squirt water, and if he might aim it at his Leicester opponent. But no. He emphasised the need to calm things down, and called for an independent body to decide the most suitable reburial site. He said he didn’t want to set York against Leicester and made jokes about not wanting to restart the Wars of the Roses. Actually, seeing the online discussions, divisions opening up, I keep thinking of the civil wars of the 17th century, when neighbour fought against neighbour. He mentioned abusive correspondence sent to York Minster. And of course this was the headline picked up by the media. We might wonder why elected officials didn’t see that it would be damaging and divisive for a city’s MPs and local authority to start campaigning against the stated position of the city’s cathedral. Of course none of those officials speaking up for a York Minster burial will admit that it’s mainly about tourism. According to the recent campaign, York people all love Richard and want to ‘bring him home’. Not that he actually lived in York Minster. Or even in York. Our MPs and City of York Council officials have eagerly stated over and over that they only want to honour Richard’s ‘wish’ to be buried in York Minster. CoYC even had a poster printed, displayed at the entrance to the city’s Guildhall, calling on residents to support Richard’s ‘wishes’ regarding a York Minster burial. In presenting this as undisputed fact they’re disregarding entirely the questions historians might ask, and the doubts they might raise. Whenever anyone asks in online forums for indisputable proof of this wish none is produced, because there isn’t any. Julian Sturdy could have said ‘No, we’re just focussing on this alleged wish because it’s getting a lot of support’. But instead swerved into an evasive ‘the evidence comes from the city of York’. And then tried to change tack a little with mention of his ‘living descendants’. Then resorted to: ‘the call is strong, from the great county of Yorkshire’. YEAH, WE’RE SHOUTING AT YOU GUYS TO STOP MISREPRESENTING US AND REPEATING QUESTIONABLE ‘FACTS’. CAN YOU HEAR US YET? The BBC’s Question Time is in York this coming week, and this will obviously be one of the issues discussed. It’s all got very silly. Hugh Bayley says he doesn’t want a fight, but everyone out here can see that there is one. Elected representatives like Hugh Bayley don’t have time to read the results of their proclamations, the ripples outward, the result in online comment and social media. Which is often misinformed, factually incorrect, often outraged (with a lot of exclamation marks). I’ve seen some ludicrous, laughable comments online about the city of York and the county of Yorkshire, and what we want. And some equally ignorant, and racist, comments about Leicester. Occasionally, sensible observations. The majority of local residents probably don’t feel as strongly as I do, or as my correspondent quoted above does. Most, I think, are indifferent. I can’t blame them for that: I wish I’d remained in the ‘don’t care’ camp. But perhaps if we do care, and don’t feel that the ‘bring him home’ campaign represents our view, we should make that known. In Leicester, they’re already arguing about the proposed tomb, as the cathedral thinks a slab type arrangement would be more suitable, but many want a more obvious and substantial monument. 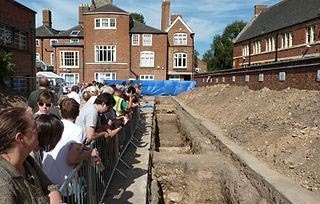 Because of the rival bid, Leicester is under increasing pressure to prove it is fit to host the royal remains. And in Westminster Hall last Tuesday another MP suggested Richard’s bones should be brought up to Yorkshire for a ‘lying in state’ at York Minster. And again there’s debate about the need for a Catholic service. A well-worn phrase comes to mind, directed not at the poor wrangled-over bones of a long-dead human being, but at those who are arguing over them. A small selection of comments noticed while browsing, a representative sample perhaps. I’ll leave my readers to decide which they find most accurate. The website of the Richard III Society, news section: their report of the adjournment debate, explanation and clarification. They also include an article by the historian Peter Hammond: Richard III and York, discussing the evidence regarding Richard III’s ‘wishes’. Very clear and helpful information. Hansard: full transcript of the debate. Or available to view here. Jonathan Ashworth’s question, mentioned above, is at 21 mins 45. For earlier postings on this subject, select the ‘Richard III’ tag or see recent postings list. I would be grateful if you don’t quote me out of context in your blog and without my authorization. It referred to an online article I posted on the Society fb page and without it, the comment does not make much sense. No problem, have removed the quote. Just added, under ‘More information’, above, links to the Richard III Society’s website, which now includes their report of the adjournment debate. It also includes helpful clarification of the term ‘descendant’ (some of the ‘collateral descendants’ of Richard III have featured in recent coverage). Most importantly, it has an article on the evidence/lack of evidence regarding Richard III’s wishes.